The auctions for Self-Portrait with Pipe, 2008 #7, 8, 9 closed last night with a flurry of last minute activity on the last of them (which I lost). All but #9 sold for less than $100. So, it looks as though the action has been tapering off. Early bids don’t matter, and buyers come in at the last minute, willing to go as high as the proces will take them in a very short period of time. It’s a prudent approach. I think I know who bought these three, and I’m glad he won. I know that the paintings will make them happy. Now, the 10th paintings is under the virtual gavel, and it’s probably the best of the series. You can see the detail that typically characterizes Nelson Diaz’s larger portraits. I love this painting, and I know that another collector does, too. So, I put in my now ceremonial first bid and plan to back away. I got my painting earlier in the process (#2), and I don’t want to interfere with the story any more. This will be the last painting in this experiment, so get ready to bid! After #10, Nelson will go back to selling his work for higher, much more appropriate prices. 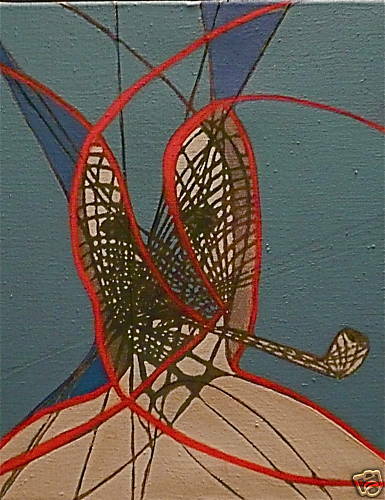 This entry was posted in Media, New York and tagged Art, art market, Auction, eBay, Francis Bacon, Manhattan, Nelson Diaz, New York, SoHo on July 28, 2008 by Tom.